Mix all dry ingredients together with a whisk (except sugar) in a large bowl. Mix oil, sugar and vanilla together in medium bowl. Beat in eggs. Make a well in the center of the dry ingredients and mix in wet ingredients. Mix until blended. You may want to drain off some of the juice from the thawed, frozen strawberries. Grease pans. For two 9 x 5 x 3 loaf pans, bake for 50-60 minutes. 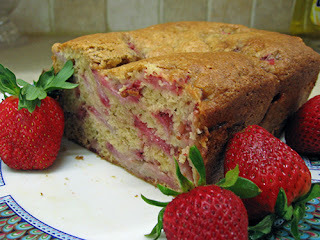 This entry was posted in B and B recipes by Margi Erickson. Bookmark the permalink.